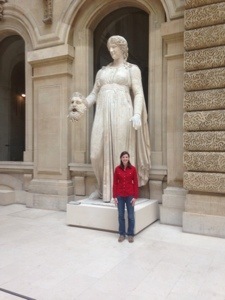 Just wanted to share a few tips that might help you when leaving Paris via the Gare de Lyon. During the evening of day 5 in Paris, we met up with some dear friends of ours from Greenville, who happened to be in Paris for business. We took them to a cafe by our apartment and the food was amazing, so good in fact we didn’t stop to take a picture to show you instead we just shoveled it down! We had talked about our trips thus far and what each of us had already visited and they mentioned the chocolate museum! What?! Have I died and gone to heaven? It makes sense that there would be one in such a place as Paris but at the same time Chris and I have been saying to each other that all we want to do is find the chocolatier and have an awesome handcrafted piece of chocolate. Don’t take your toddler. It’s that simple. 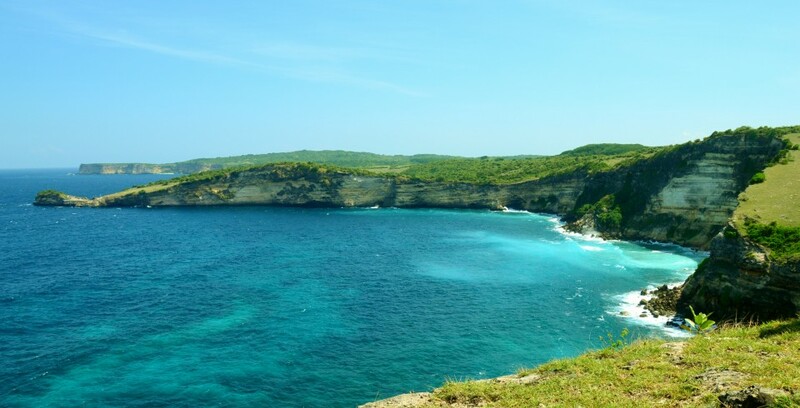 This is a day trip that is best for just adults or toddlers that are old enough to understand to hold you hand and walk with you quietly. 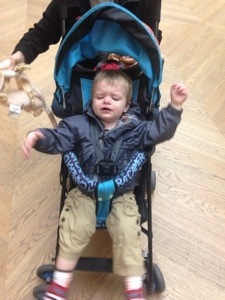 This morning we wanted to give Killian some much needed freedom from the stroller and after getting our morning bread and pastries we headed to Jardin des Plantes. We unleashed our wild toddler and he had a ball running up and down the hill, watching all of the runners do their laps around us and playing in the dirt. After about 30 minutes we were able to get him to follow us and we walked into the park a little ways and we were pleased to finally see a playground. We have been spoiled with Bangkok because there are parks and kid stuff to do everywhere! Paris probably has those things too but none that we have come across yet. As we were playing on the playground I look across the way and see a kangaroo. I blink a couple of times and make sure my eyes aren’t just blurry (I figure it must be a dog) and look again and sure enough there was a group of about 10 kangaroos just hanging out and enjoying the morning sun. We are a little confused as to why they are in the park but then we see a sign for a menagerie and it starts to make a little more sense. May 31st is our anniversary, we have been together for 10 years (5 years of dating and 5 years of marriage). Since we are in Paris on our anniversary I figured the most romantic thing we could do, with a toddler in tow, was visit the Eiffel Tower on our special day. I had plans of a champagne toast on the top observation deck and lunch on the first floor but that didn’t happen, like I said we had a toddler in tow and he wasn’t in the mood for romance. 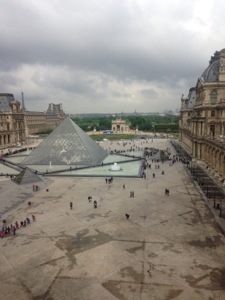 On our second day in Paris it was rainy and cold so we thought it would be a good idea to do an indoor activity and go to the Louvre. We arrived about 45 minutes before they opened to wait in line to purchase our tickets. 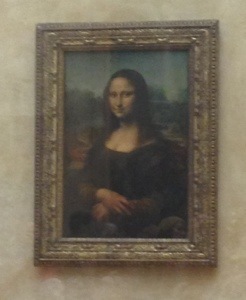 Once inside the museum, we rushed straight to Da Vinci’s Mona Lisa. 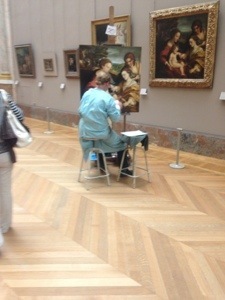 Such a small painting but still remarkable. 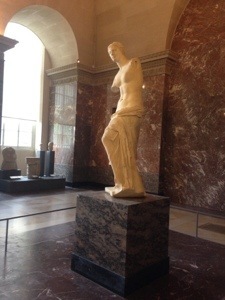 Then we were off to see the Venus de Milo and some more of the highlights from our travel book. 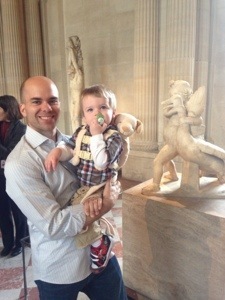 After we accomplished our mission, we just took it easy and wandered all over the museum. Killian was even able to run around and enjoy himself in the less crowded portions. 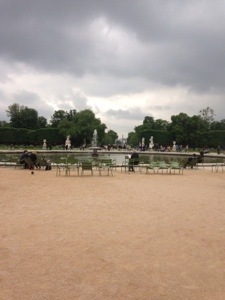 After the Louvre, we took a stroll in the Jardin des Tuileries. This is a beautiful garden right outside the Louvres exits. Even though it was raining that didn’t stop us from having a great time! We had lunch at a cafe in the garden and it was delicious. I had my first French crepe filled with ham, cheese, egg and mushroom and for dessert a Nutella crepe that was out of this world! I learned my lesson from the other day and went with a glass of wine instead of the water. 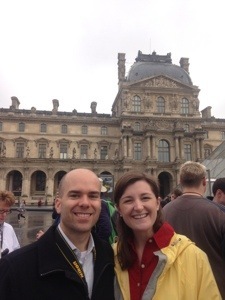 Below are some travel tips for anyone that might be planning their vacation in Paris! Hope they help! 1. 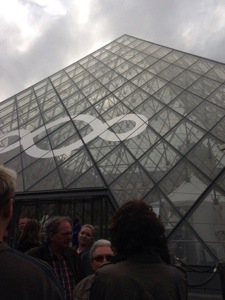 If you already have your tickets to the Louvre do not use the main pyramid entrance. I know that’s its flashy and touristy but take the entrance to the right of the mini looking Arc de Triumph this is with your back to the Louvre. There is a side underground entrance with far less traffic! 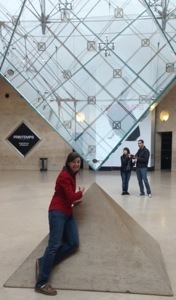 If we have any Da Vinci Code fans you will get to see the two pyramids opposing each other (see picture below). 2. If you do not have your ticket go to the pyramid and stand in the line that say sans tickets. I would recommend getting there 1 hour to 45 minutes before they open because if you are there 30 minutes before they open the line is already outrageous. 3. 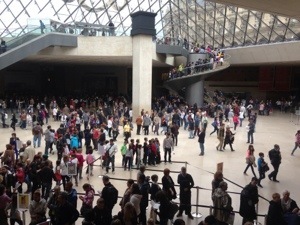 Since you are one of the first in line go straight to the Grand Gallery in the Denon wing and go straight to room 6 to see the Mona Lisa. 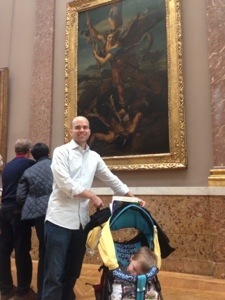 Because you are the first the museum you will actually be able to stop and appreciate the famous painting without hundreds of people trying to push you out of the way to get a quick pic. 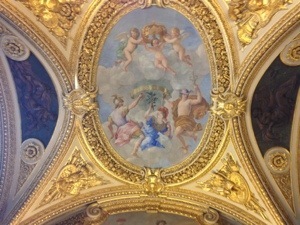 This also provides you with ample time to enjoy the Grand Gallery, it’s grand for a reason! 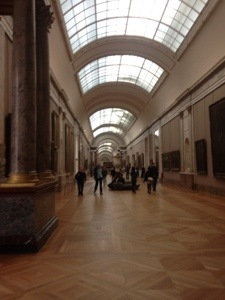 The paintings in this room are amazing and you get to see the works from some of the most famous ninja turtles…. I mean painters of our childhood… I mean time. 4. 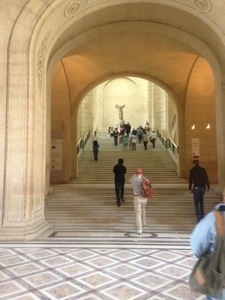 After the Mona Lisa go directly downstairs to the Sully wing of the museum to see the Venus de Milo. Again there isn’t hardly anyone in the museum yet because they are all still in line and you can actually get a close up shot without people throwing elbows. 5. Despite what you may think, prices in Paris are really not so outrageous when it comes to food except when you want to eat in the Louvre. Expect to pay around $8 USD for a soggy premade sandwich. 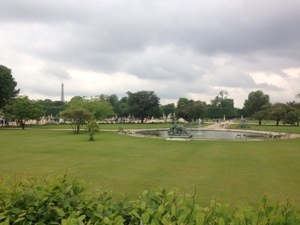 Instead walk outside to the Jardin des Tuileries and have a nice lunch in one of the two cafes available, which will still cost around $45 USD but at least it will taste better and it’s more of a fun experience then sitting in a crowded cafeteria. 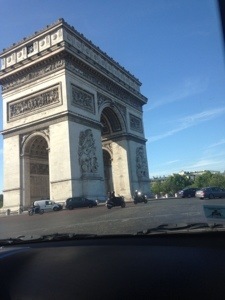 Yesterday we arrived in Paris at 7:05am. As we exited the airport we were greeted by a pick up service, First Way. I highly recommend this business if you are needing a driver to and from the airport. Nicolas was very helpful and spoke to us the entire drive into Paris about must see attractions and was even so kind as to take us on a small driving tour to show us the highlights as we made our way to the apartment. For this stay in Paris, I had a friend in Bangkok suggest we rent an apartment for the week instead of paying for a hotel room. What amazing advice that was! Instead of staying in a cramped hotel room we are living like locals in our one bedroom apartment that is fully furnished with all the amenities! I love the fact that I can walk right outside my door and step onto the metro or go to the boulangerie patisserie and have my pan at chocolat in the morning…. C’est Paris! 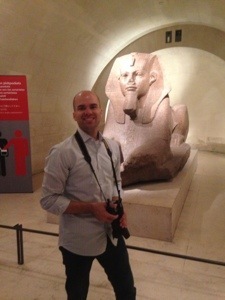 I would highly recommend Paris Attitude if you are looking to book an apartment stay while visiting Paris.